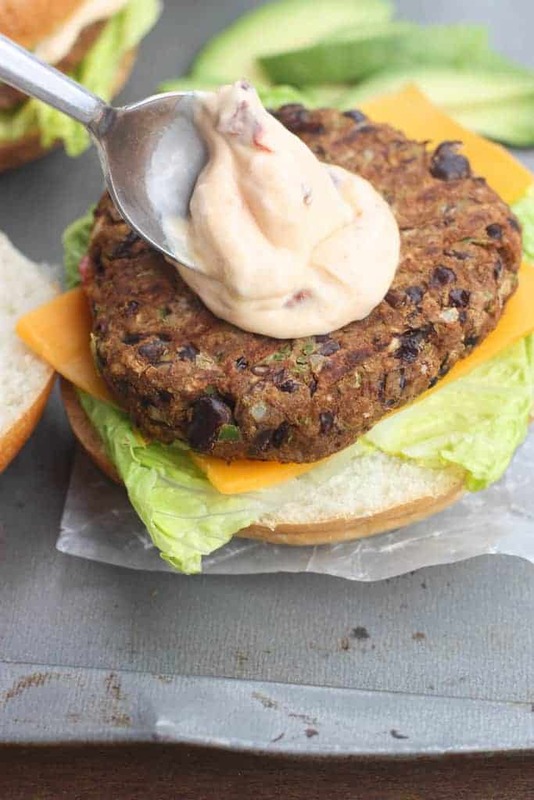 The BEST Black Bean Burger made with fresh ingredients and totally FOOL PROOF. Your entire family will love them! 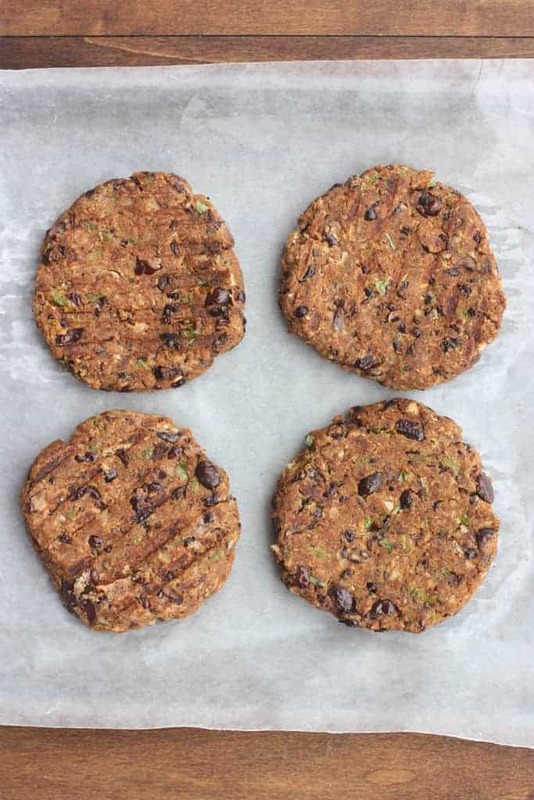 If you want to know how to make a black bean burger, you are in the right place! These amazing homemade black bean burgers have been a huge family favorite ever since I first made them over 3 years ago! The ingredients in these amazing black bean burgers are simple: beans, bell pepper, and onion mixed with egg, bread crumbs, and spices. My kids LOVE them, and even my meat-loving husband will happily eat these instead of a ground beef patty. If you’re like me, you may have tried veggie burgers in the past that were tasteless or didn’t hold together. 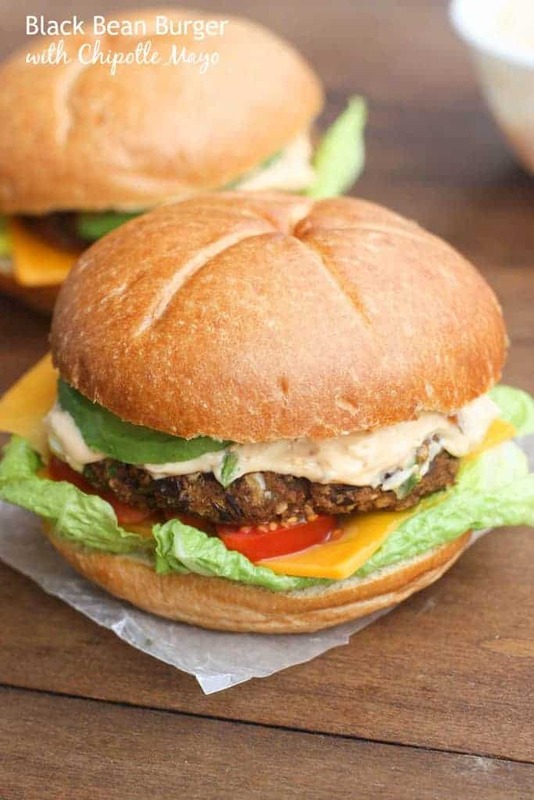 Well, this black bean burger will be your happy relief! It’s packed full of flavor, holds together perfectly and is super easy to grill. 1. After chopping the bell pepper and onion, strain the mixture really well. Removing that extra liquid will keep the burger from falling apart. Once you add the egg and breadcrumbs they will bind together really well. 2. If you decide to grill them, make sure your grill is well greased. We don’t want them to stick the grill when you try to flip them. You could use cooking spray, or oil your grill with a brush. 3. You can make these burgers in advance if you want a stress-free dinner. Make them and cover them well in the fridge before baking. They also freeze really well! I lay them flat inside a ziplock freezer bag. Place a piece of parchment paper between them if you stack them. When you’re ready to grill them you can cook them from frozen or let them come to room temperature in your fridge. 4. 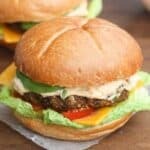 The texture of these burgers is a little softer than a regular burger, which can be expected since it’s made with black beans, but it’s totally amazing! Pile on the homemade chipotle mayo sauce, lettuce, tomatoes, cheese, and avocados and you’ll be in healthy burger heaven! desired burger toppings: lettuce, tomato, etc. Place rinsed and drained black beans in a bowl. If needed, blot them with a paper towel to remove any extra moisture. Place in a large bowl and mash well with a fork. Place the bell pepper, onion and garlic in a food processor and process until finely minced. Add the strained vegetable mixture to the bowl with the black beans. Add the chili powder, cumin and salt and pepper and stir to combine. Add beaten egg and mix. Stir in bread crumbs. Form mixture into 4 or 5 patties. Grill the burgers on a well oiled grill for about 4-5 minutes on each side. Bake them at 375 degrees F on a lightly oiled baking sheet, for 10 minutes on each side. Cook them on your stove using a grill pan, for 4-5 minutes on each side. Freeze them, covered, in a freezer ziplock bag for a quick weeknight dinner in the future. Add all the ingredients to a food processor or blender and puree until smooth. Season with salt and pepper to taste. Serve burgers on a white or whole wheat bun topped with a spoonful of chipotle mayo, lettuce, tomato, cheese, avocado, or any other desired toppings! Enjoy! Serve with one of these healthy side dishes! *for a vegan burger, substitute the egg with 1 Tbs. flax meal + 3 Tbs. hot water (mix this together separately). Tips for making these burgers are listed in the post above! 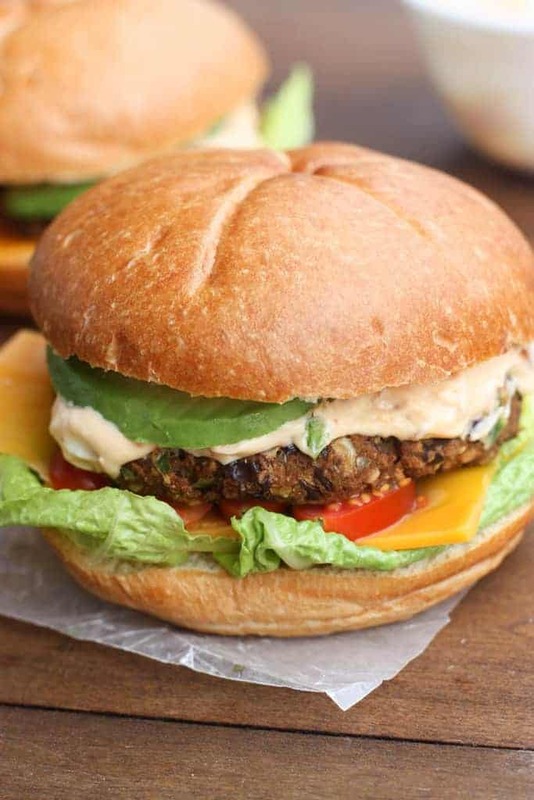 Try my other favorite veggie burger! These were delicious! I made a double recipe and used flax egg (my bestie is vegan). I also sauteed the veggies, smushed out the extra liquid in paper towels before adding to beans. Since I made a double batch I used half chili powder and half smoked chipotle pepper which added a nice smokiness. Leftovers are in the freezer can’t wait to eat them again! Thanks so much! Best ever! I added grated beets. Recipe is spot on! Loved them and we’re not even vegetarians! I really enjoyed these burgers per recipe except for the breadcrumbs. I only hand Japanese panko on hand but they also worked. Even hubby whose is a professional chef and a true carnivore enjoyed them. Best advice was to remove any excess liquid so burger hold together. I mixed tomatillo salsa with mayo as I did not have poblanos in adobo sauce, served with sliced avocado, tomato and lettuce. Thank you, I’ll be making theses again. Were really delicious but I did add a lot more garlic and fresh green chillies. Ate them with fresh salad vegetables and wholemeal buns for an even healthier dinner.